Pictured: Penny Robb (fourth left) and Louise Campton (fifth left) with some of the apprentices. A growing education business in Coventry is searching for 30 apprentices to join its Teachers Apprentice Programme which has been specifically designed to help schools embrace digital learning and technology in the classroom. 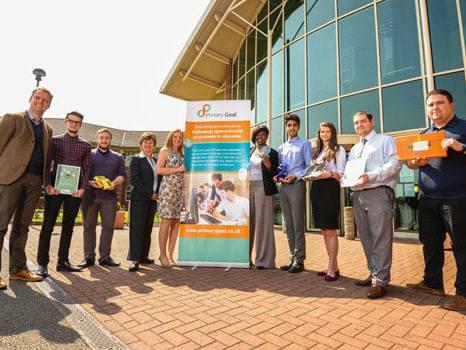 Primary Goal was founded by Louise Campton, and with the guidance of the University of Warwick Science Park’s Ignite Programme, has established a successful start-up company. The Ignite ‘incubation’ service offers micro and start-up companies a range of business support, mentoring and a furnished office facility on a sliding rent basis to help them get off the group. Primary Goal has now moved into a new base at the University of Warwick Science Park’s Business Innovation Centre in Binley, and is on the lookout for young people to offer a unique service to schools combining technical hardware and curriculum support. Each apprentice will be based at a school full time to support teachers with a variety of tech-related issues such as login and printer issues, projector bulb replacement and use of green screens whilst assisting teachers to use technology across all curriculum subjects. The apprentices will complete a six to eight week traineeship programme before being placed into a school. This programme combines personality assessment, confidence and social skills, online computing and technology assessment, face-to-face training using curriculum technology, e-safety and support towards engaging teachers and interacting with children. Once the learners have been selected for a post in a school they will work towards a Microsoft Level 3 and 4 IT apprenticeship framework combined with the Microsoft Educators Award. This will enable the apprentice to develop the perfect balance of skills for working within a school environment and creating an opportunity to train as a teacher or ICT lead in the future. Throughout their time at their respective schools, each apprentice will be mentored by specialist staff covering technical support, hardware maintenance, software development, curriculum delivery, use and development of AV equipment, e-safety and child protection. Louise Campton, Founder and Director of the Primary Goal business, says combining IT and curriculum support will benefit participating schools and the future of the IT industry. Louise said: “This is a unique service where our apprentices will help teachers to bring the school curriculum to life for so many school children in Coventry and Warwickshire by utilising the Microsoft toolkit. “For the first time, some teachers will have a full time “go to” person for all things technology for five days a week. If there is a more serious issue then the apprentice has a full range of support at their fingertips. Another initiative being driven by Primary Goal is a lunchtime and afterschool club called Mini-Geeks. This is where schoolchildren as young as six-years-old are supporting other children with their knowledge of specialist computer coding through packages such as Kodu. This is further supported by the Tablet Academy which offers apprentices and their school’s IT lead four free training sessions a year on using innovative technology to bring the curriculum to life. Coventry schools already working with Primary Goal are John Shelton Primary School, Parkgate Primary School, Sacred Heart Catholic Primary School, Manor Park Primary School and Good Shepherd Primary School. Further schools in Nottingham, Solihull and Derby have also signed up to start in September. Primary Goal was helped with its expansion by a business growth initiative called Ignite, which provides advice and support to entrepreneurs on starting up and growing their business which is funded by Advantage West Midlands. Penny Robb, manager of the University of Warwick Science Park’s Business Innovation Centre, added: “Digital skills are becoming increasingly important in the work place, and it’s fantastic to see a business that is helping different generations – including youngsters, school leavers and teachers – to get to grips with the ever-changing technological landscape. For more information about the service and vacancies, contact louise.campton@primarygoal.co.uk or visit the Primary Goal website on www.primarygoal.co.uk.